Matt Paterson scored twice as Southend beat Barnet in the second round of the Johnstone's Paint Trophy. The striker slotted in Harry Crawford's cross from close range early on before the visitors had Bilel Mohsni given a straight red card after a mass brawl. Paterson added a second after confusion in the Bees defence before Mauro Vilhete headed one back for the hosts. But hope of a home comeback was soon extinguished when Louie Soares's deflected effort found the net. "I'm very pleased, especially in difficult circumstances. When we went down to 10 men, we went and got a second goal. "Their attitude and work rate was fantastic, but they worked so hard at the shape of the team. "When we had two banks of four they didn't penetrate us in any way and I'm very pleased with everybody." 90:00+3:54 Goal kick taken long by Rhys Evans (Southend). 90:00+3:22 Foul by Anthony Grant (Southend) on Mark Byrne (Barnet). Free kick taken right-footed by Jake Cole (Barnet) from own half, resulting in open play. 90:00+3:01 Attacking throw-in by Josh Simpson (Southend). 90:00+2:49 Shot by Anthony Grant (Southend) drilled right-footed from left channel (20 yards), blocked by Clovis Kamdjo (Barnet). 90:00+2:01 Foul by Mauro Vilhete (Barnet) on Sofiene Zaaboub (Southend). Free kick taken right-footed by Josh Simpson (Southend) from left channel, passed. 90:00+0:14 Foul by Rossi Jarvis (Barnet) on Anthony Grant (Southend). Free kick taken right-footed by Sean Clohessy (Southend) from right channel, passed. 89:33 Goal kick taken long by Rhys Evans (Southend). 89:21 Shot by Grant Basey (Barnet) drilled right-footed from left channel (30 yards), over the bar. 89:14 Attacking throw-in by Mark Byrne (Barnet). 88:56 Attacking throw-in by Sam Cox (Barnet). 88:23 Defending throw-in by Sean Clohessy (Southend). 87:30 Foul by Phil Walsh (Barnet) on Chris Barker (Southend). Free kick taken right-footed by Rhys Evans (Southend) from own half, resulting in open play. 86:58 Defending throw-in by Sam Cox (Barnet). 85:58 Inswinging corner from left by-line taken right-footed by Jordan Parkes (Barnet) to centre, clearance by Josh Simpson (Southend). 85:02 Substitution Southend substitution: Ryan Hall replaced by Sofiene Zaaboub (tactical). 84:17 GOAL - Louie Soares:Barnet 1 - 3 Southend Goal by Louie Soares (Southend) left-footed (high centre of goal) from left channel (18 yards).Barnet 1-3 Southend. 83:24 Attacking throw-in by Sam Cox (Barnet). 80:52 Foul by Mauro Vilhete (Barnet) on Peter Gilbert (Southend). Free kick taken right-footed by Rhys Evans (Southend) from own half, resulting in open play. 80:52 Booking Mauro Vilhete (Barnet) booked for unsporting behaviour. 80:04 Attacking throw-in by Jordan Parkes (Barnet). 79:18 Substitution Barnet substitution: Joe Devera replaced by Sam Cox (tactical). 78:32 Inswinging corner from right by-line taken right-footed by Jordan Parkes (Barnet) to centre, assist (cross) by Jordan Parkes (Barnet) from right wing. 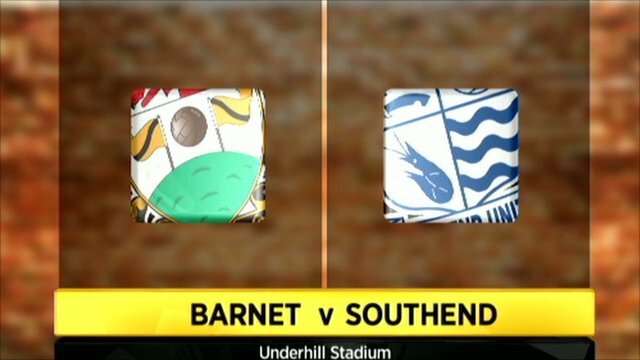 78:32 GOAL - Mauro Vilhete:Barnet 1 - 2 Southend Headed goal by Mauro Vilhete (Barnet) (high centre of goal) from centre of penalty area (12 yards).Barnet 1-2 Southend. 77:36 Inswinging corner from left by-line taken right-footed by Jordan Parkes (Barnet) to centre, resulting in open play. 77:11 Inswinging corner from right by-line taken right-footed by Mark Marshall (Barnet) to centre, clearance by Rhys Evans (Southend). 76:44 Outswinging corner from right by-line taken right-footed by Mark Marshall (Barnet) to short, resulting in open play. 76:21 Attacking throw-in by Jordan Parkes (Barnet). 75:24 Attacking throw-in by Joe Devera (Barnet). 74:07 Foul by Ricky Holmes (Barnet) on Anthony Grant (Southend). Free kick taken right-footed by Rhys Evans (Southend) from own half, resulting in open play. 73:47 Foul by Graham Coughlan (Southend) on Ricky Holmes (Barnet). Free kick taken right-footed by Grant Basey (Barnet) from left channel, passed. 72:55 Attacking throw-in by Joe Devera (Barnet). 72:26 Defending throw-in by Mark Byrne (Barnet). 72:16 Cross by Jordan Parkes (Barnet), clearance by Chris Barker (Southend). 71:54 Attacking throw-in by Jordan Parkes (Barnet). 71:34 Attacking throw-in by Jordan Parkes (Barnet). 70:37 Attacking throw-in by Joe Devera (Barnet). 70:37 Substitution Southend substitution: Matthew Paterson replaced by Nathaniel Jarvis (tactical). 69:45 Foul by Mauro Vilhete (Barnet) on Peter Gilbert (Southend). Free kick crossed left-footed by Chris Barker (Southend) from right channel, resulting in open play. 68:58 Goal kick taken long by Rhys Evans (Southend). 68:48 Attacking throw-in by Jordan Parkes (Barnet). 67:59 Goal kick taken long by Rhys Evans (Southend). 67:34 Attacking throw-in by Peter Gilbert (Southend). 66:50 Goal kick taken short by Jake Cole (Barnet). 66:40 Shot by Josh Simpson (Southend) drilled right-footed from left channel (25 yards), over the bar. 66:12 Attacking throw-in by Peter Gilbert (Southend). 64:47 Attacking throw-in by Sean Clohessy (Southend). 63:52 Foul by Mark Marshall (Barnet) on Josh Simpson (Southend). Free kick crossed right-footed by Sean Clohessy (Southend) from right channel, clearance by Jordan Parkes (Barnet). 63:26 Attacking throw-in by Sean Clohessy (Southend). 62:53 Foul by Mark Byrne (Barnet) on Chris Barker (Southend). Free kick taken right-footed by Rhys Evans (Southend) from own half, resulting in open play. 62:53 Booking Mark Byrne (Barnet) booked for unsporting behaviour. 61:20 Foul by Mark Byrne (Barnet) on Anthony Grant (Southend). Free kick taken right-footed by Rhys Evans (Southend) from own half, resulting in open play. 61:13 Attacking throw-in by Joe Devera (Barnet). 59:27 Attacking throw-in by Joe Devera (Barnet). 58:39 Goal kick taken long by Rhys Evans (Southend). 57:08 Defending throw-in by Peter Gilbert (Southend). 55:54 Attacking throw-in by Jordan Parkes (Barnet). 54:40 GOAL - Matthew Paterson:Barnet 0 - 2 Southend Goal by Matthew Paterson (Southend) right-footed (high centre of goal) from centre of penalty area (18 yards).Barnet 0-2 Southend. 53:46 Foul by Phil Walsh (Barnet) on Anthony Grant (Southend). Free kick taken right-footed by Rhys Evans (Southend) from own half, resulting in open play. 53:34 Attacking throw-in by Jordan Parkes (Barnet). 52:53 Inswinging corner from left by-line taken right-footed by Mark Marshall (Barnet) to centre, resulting in open play. 52:37 Substitution Southend substitution: Harry Crawford replaced by Graham Coughlan (tactical). 52:24 Cross by Louie Soares (Southend), clearance by Joe Devera (Barnet). 51:09 Booking Phil Walsh (Barnet) booked for unsporting behaviour. 50:55 Foul by Bilel Mohsni (Southend) on Mauro Vilhete (Barnet). 50:55 Sent off Bilel Mohsni (Southend) dismissed for violent conduct. 48:53 Attacking throw-in by Sean Clohessy (Southend). 48:33 Attacking throw-in by Sean Clohessy (Southend). 48:04 Goal kick taken long by Jake Cole (Barnet). 47:28 Foul by Phil Walsh (Barnet) on Anthony Grant (Southend). Free kick taken right-footed by Rhys Evans (Southend) from own half, resulting in open play. 47:02 Foul by Louie Soares (Southend) on Mark Byrne (Barnet). Free kick taken left-footed by Grant Basey (Barnet) from own half, passed. 46:53 Booking Peter Gilbert (Southend) booked for unsporting behaviour. 46:47 Defending throw-in by Sean Clohessy (Southend). 46:29 Attacking throw-in by Joe Devera (Barnet). 45:58 Handball by Anthony Grant (Southend). Free kick taken right-footed by Joe Devera (Barnet) from own half, passed. 45:30 Defending throw-in by Jordan Parkes (Barnet). 45:01 Substitution Barnet substitution: Charlie Taylor replaced by Mauro Vilhete (tactical). 45:00+1:16 It is the end of the first-half. 45:00+1:01 Attacking throw-in by Peter Gilbert (Southend). 45:00+0:33 Foul by Ricky Holmes (Barnet) on Anthony Grant (Southend). Free kick taken right-footed by Rhys Evans (Southend) from own half, resulting in open play. 45:00+0:07 Attacking throw-in by Joe Devera (Barnet). 44:49 Defending throw-in by Peter Gilbert (Southend). 43:54 Defending throw-in by Joe Devera (Barnet). 43:32 Attacking throw-in by Joe Devera (Barnet). 43:14 Goal kick taken long by Jake Cole (Barnet). 43:02 Weak header by Harry Crawford (Southend) from centre of penalty area (18 yards), missed left. 42:44 Attacking throw-in by Sean Clohessy (Southend). 42:01 Goal kick taken long by Rhys Evans (Southend). 41:45 Shot by Mark Marshall (Barnet) drilled right-footed from left channel (25 yards), over the bar. 40:17 Goal kick taken long by Jake Cole (Barnet). 38:51 Foul by Sean Clohessy (Southend) on Mark Marshall (Barnet). Free kick taken right-footed by Jordan Parkes (Barnet) from own half, resulting in open play. 37:47 Attacking throw-in by Joe Devera (Barnet). 36:31 Cross by Sean Clohessy (Southend), clearance by Grant Basey (Barnet). 36:26 Attacking throw-in by Peter Gilbert (Southend). 35:23 Foul by Mark Byrne (Barnet) on Bilel Mohsni (Southend). Free kick taken right-footed by Rhys Evans (Southend) from own half, resulting in open play. 34:05 Attacking throw-in by Peter Gilbert (Southend). 33:50 Attacking throw-in by Peter Gilbert (Southend). 32:46 Defending throw-in by Sean Clohessy (Southend). 32:37 Defending throw-in by Jordan Parkes (Barnet). 31:25 Foul by Josh Simpson (Southend) on Clovis Kamdjo (Barnet). Free kick taken right-footed by Jake Cole (Barnet) from own half, resulting in open play. 31:14 Shot by Ryan Hall (Southend) drilled left-footed from right channel (20 yards), blocked by Jordan Parkes (Barnet). 30:37 Goal kick taken long by Jake Cole (Barnet). 30:23 Shot by Louie Soares (Southend) drilled left-footed from left channel (18 yards), missed right. 29:38 Attacking throw-in by Sean Clohessy (Southend). 27:12 Foul by Mark Byrne (Barnet) on Anthony Grant (Southend). Free kick taken right-footed by Rhys Evans (Southend) from own half, passed. 26:36 Foul by Ryan Hall (Southend) on Mark Marshall (Barnet). Free kick taken right-footed by Jake Cole (Barnet) from own half, resulting in open play. 25:54 Attacking throw-in by Joe Devera (Barnet). 25:44 Defending throw-in by Jordan Parkes (Barnet). 24:27 Foul by Ricky Holmes (Barnet) on Anthony Grant (Southend). Free kick taken right-footed by Josh Simpson (Southend) from right channel, passed. 23:57 Defending throw-in by Jordan Parkes (Barnet). 23:30 Attacking throw-in by Peter Gilbert (Southend). 22:54 Defending throw-in by Joe Devera (Barnet). Correction - 21:44 Assist on the goal came from Louie Soares. 21:44 Assist (pass) by Louie Soares (Southend) from right channel. 21:44 GOAL - Matthew Paterson:Barnet 0 - 1 Southend Goal by Matthew Paterson (Southend) right-footed (low centre of goal) from centre of penalty area (18 yards).Barnet 0-1 Southend. 21:13 Booking Jordan Parkes (Barnet) booked for unsporting behaviour. 20:14 Foul by Jordan Parkes (Barnet) on Ryan Hall (Southend). Free kick drilled right-footed by Louie Soares (Southend) from right channel (20 yards), comfortable save (caught) by Jake Cole (Barnet). 18:22 Outswinging corner from right by-line taken right-footed by Louie Soares (Southend) to centre, clearance by Clovis Kamdjo (Barnet). 16:27 Foul by Peter Gilbert (Southend) on Ricky Holmes (Barnet). Free kick taken right-footed by Ricky Holmes (Barnet) from right channel, resulting in open play. 15:44 Attacking throw-in by Joe Devera (Barnet). 15:36 Cross by Mark Marshall (Barnet), clearance by Peter Gilbert (Southend). 15:09 Attacking throw-in by Jordan Parkes (Barnet). 14:50 Goal kick taken long by Jake Cole (Barnet). 14:19 Foul by Charlie Taylor (Barnet) on (Southend). Free kick taken right-footed by Rhys Evans (Southend) from own half, resulting in open play. 13:39 Goal kick taken long by Jake Cole (Barnet). 13:34 Goal kick taken long by Rhys Evans (Southend). 12:49 Inswinging corner from right by-line taken right-footed by Mark Marshall (Barnet) to centre, header by Phil Walsh (Barnet) from right side of penalty area (20 yards), missed left. 11:44 Attacking throw-in by Joe Devera (Barnet). 10:14 Defending throw-in by Sean Clohessy (Southend). 9:17 Goal kick taken long by Rhys Evans (Southend). 9:11 Attacking throw-in by Jordan Parkes (Barnet). 8:46 Shot by Matthew Paterson (Southend) drilled right-footed from left side of penalty area (18 yards), comfortable save (caught) by Jake Cole (Barnet). 7:57 Attacking throw-in by Jordan Parkes (Barnet). 7:16 Shot by Anthony Grant (Southend) drilled right-footed from right channel (20 yards), save (caught) by Jake Cole (Barnet). 6:29 Inswinging corner from right by-line taken right-footed by Mark Marshall (Barnet) to centre, resulting in open play. 6:07 Defending throw-in by Peter Gilbert (Southend). 5:39 Foul by Chris Barker (Southend) on Charlie Taylor (Barnet). Free kick taken right-footed by Jake Cole (Barnet) from own half, resulting in open play. 5:23 Attacking throw-in by Peter Gilbert (Southend). 4:59 Mark Marshall (Barnet) caught offside. Free kick taken right-footed by Rhys Evans (Southend) from own half, resulting in open play. 3:08 Foul by Clovis Kamdjo (Barnet) on Ryan Hall (Southend). Free kick drilled right-footed by Josh Simpson (Southend) from right channel (25 yards), blocked by Rossi Jarvis (Barnet). 2:53 Foul by Phil Walsh (Barnet) on Anthony Grant (Southend). Free kick taken right-footed by (Southend) from own half, resulting in open play. 1:35 Attacking throw-in by Jordan Parkes (Barnet). 0:53 Defending throw-in by Jordan Parkes (Barnet).